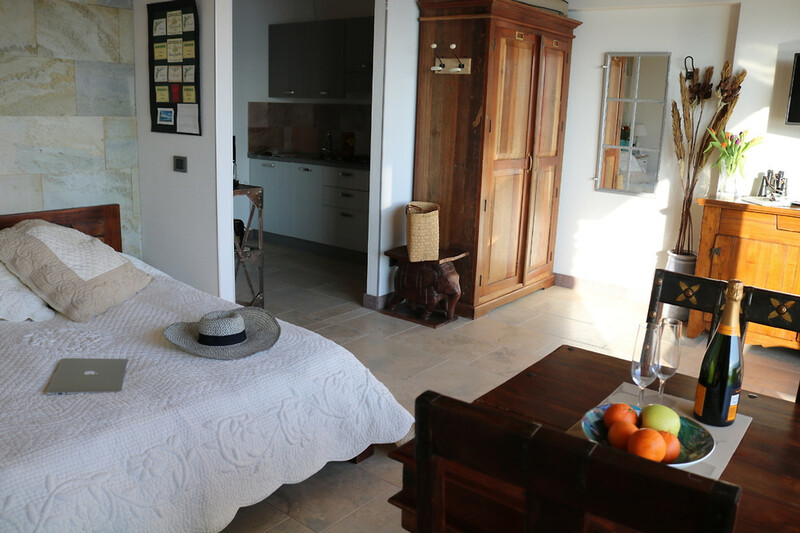 What once began as a heart project is now a lovingly "Cascina Borchina" an exclusive finca. 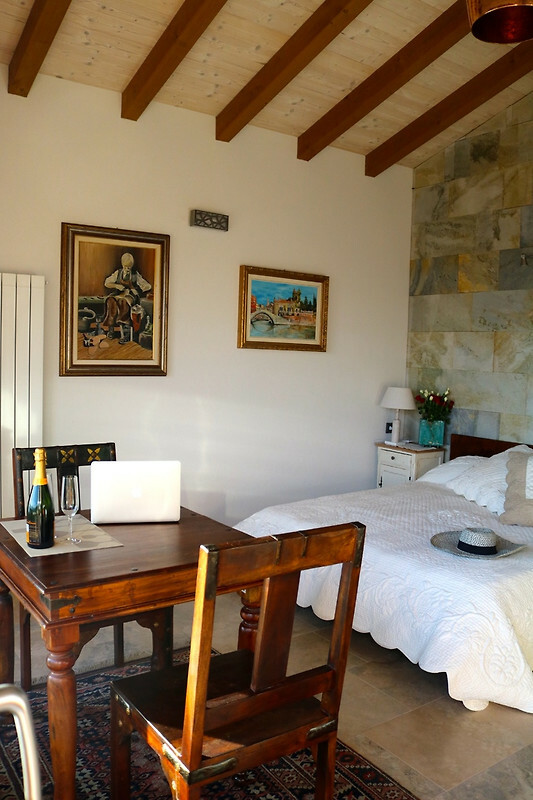 It is an indescribable, almost magical property with magnificent stone walls and gardens which promise absolute tranquility and turn your stay into a wonderful holiday. An insider tip for nature lovers in an idyllic setting. The lake and the beach are just km away. 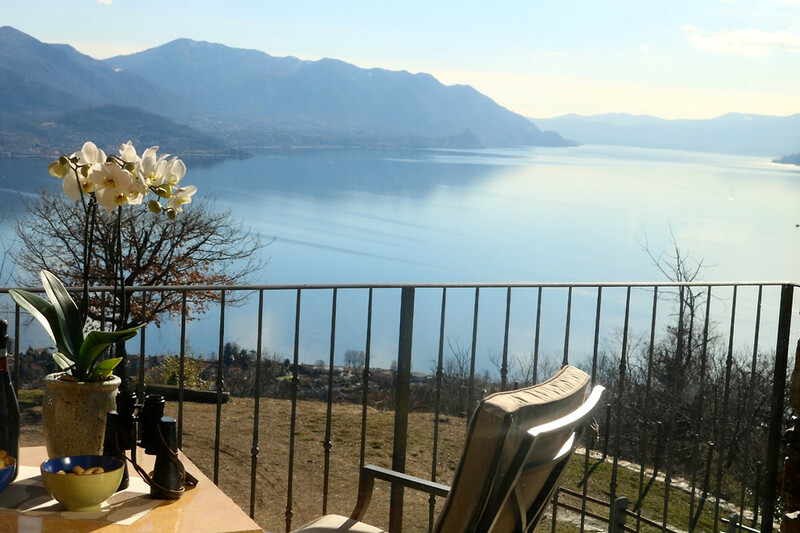 All apartments enjoy breathtaking views of Lake Maggiore. Please write to us without obligation for a quotation. The apartment "Falco" is located on the upper floor and when you arrive, the incredible view of the Lago takes you breath. You are guest in the studio "Falco". 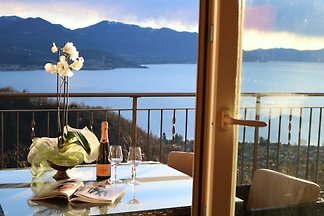 From your "Suite" you go directly to the terrace or balcony and have a wonderful view over Lake Maggiore and the picturesque landscape. 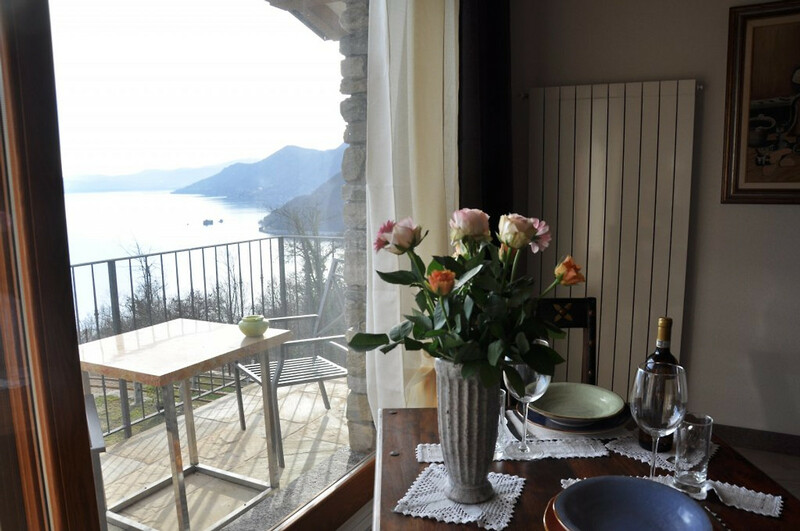 Here you can enjoy an unforgettable sunrise and sunset and the wide view over Lake Maggiore. Also the interior of the apartment leaves nothing to be desired. 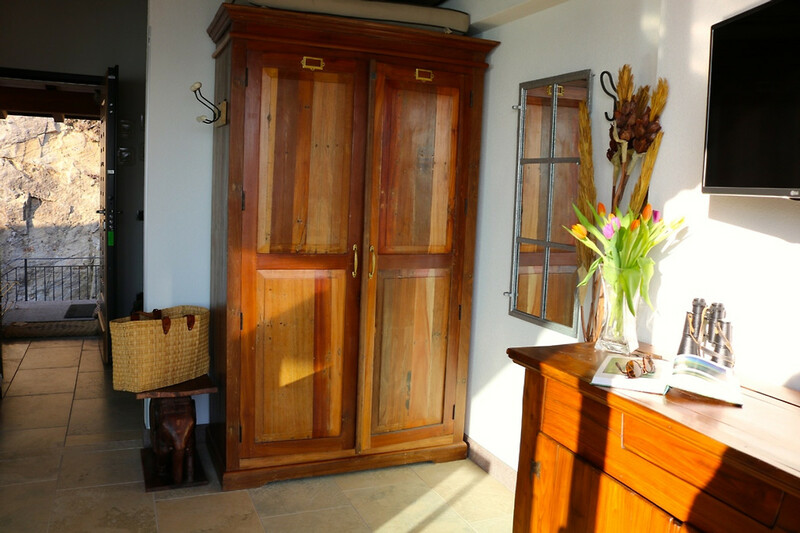 The room is equipped with a wardrobe, landscape bed, massive wooden table and wooden chairs, cabinets made of solid wood. 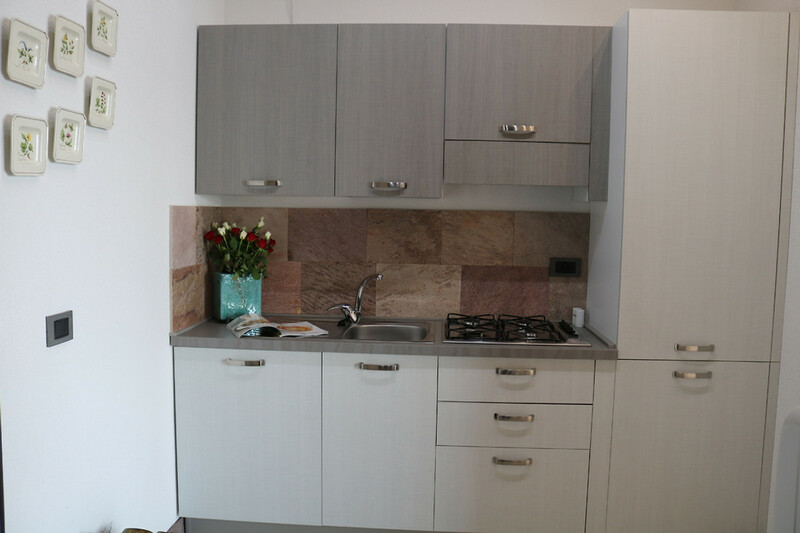 The kitchenette is separated from the room and equipped with refrigerator, freezer, 4 gas cooker, dishwasher, coffee machine, toaster, sufficient dishes, glasses and cutlery as well as kitchen utensils. 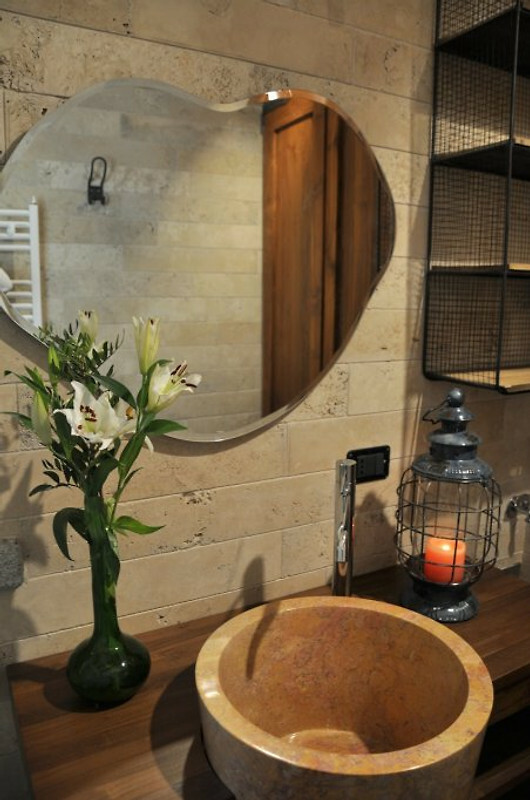 The bathroom is made of travertino, floor stone lava, stone shower and marble washbasin. TV reception via satellite for German-language television programs. Bed linen, electricity, water, gas and are included in the price. More information and our "History". More than ten years ago, we looked at the lake and dreamed with open eyes and year by year, stone by stone, has become reality from Finca Cascina Borchina. Restored and rebuilt, according to old pre-existing farmhouses, today it is a small finca with Family business, opening April 2017. 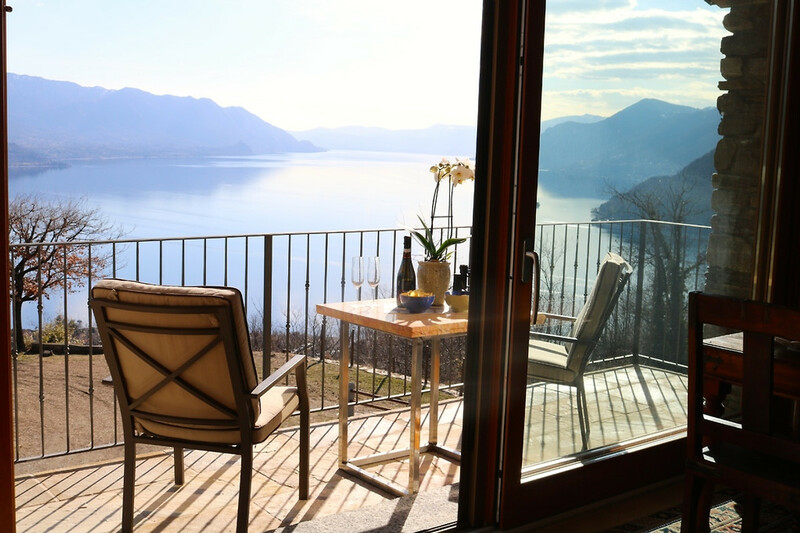 Finca Cascina Borchina is located on a hillside and offers a breathtaking view of Lake Maggiore and in words it is really hard to describe. For this reason, we have made numerous photos (all of our estate and not of viewpoints) so you have an idea of ​​our view and of the countryside, but it is always only a part of what we offer. We assure you that it is much more beautiful in "nature"! What distinguishes the structure is undoubtedly the attention to detail and the choice of materials. 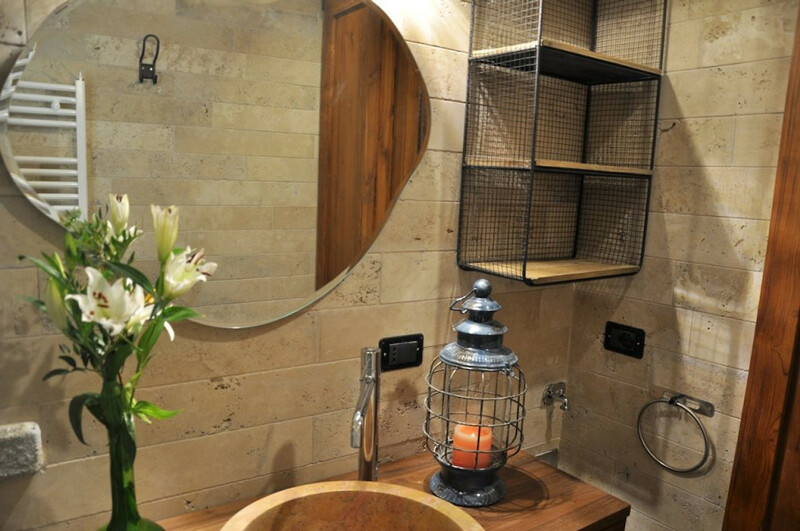 In the years we have always tried to create an elegant and refined environment, but at the same time rustic, to connect with the surrounding nature. 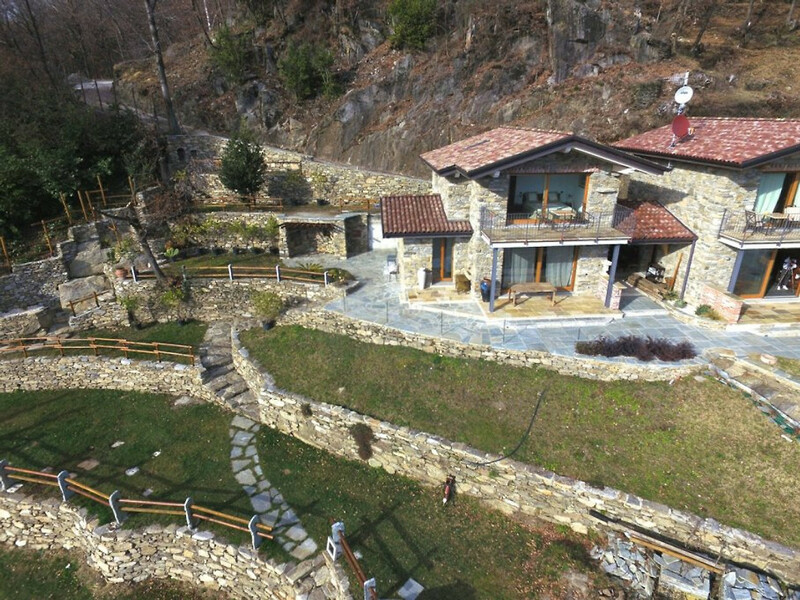 The exterior walls of the house are completely made of stone, gneiss, brick and granite, while the floors (both external and internal) are exclusively in marble, lava, travertino, slate and stone. 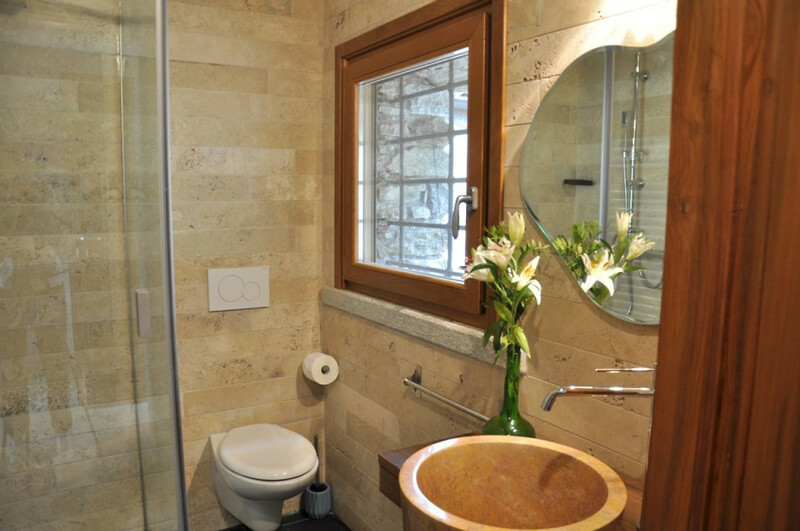 We have tried, as far as possible, to use sustainable materials, such as ecological cement for building and recycling furniture in the apartments, but also the walls and exterior walls of the old pre-existing farmhouse, respecting the ancient tradition. 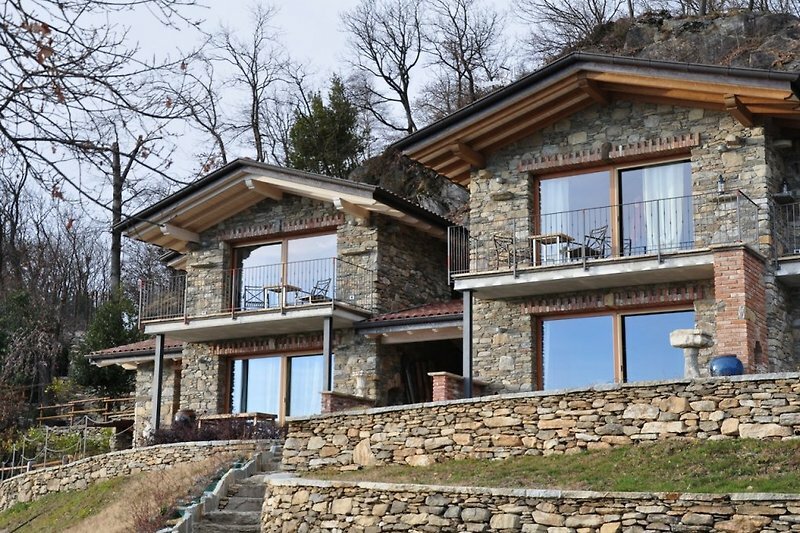 We have tried not to avoid ecological materials and prefer to use wood and stone to create herbeds around the house to facilitate integration with the surrounding vegetation. 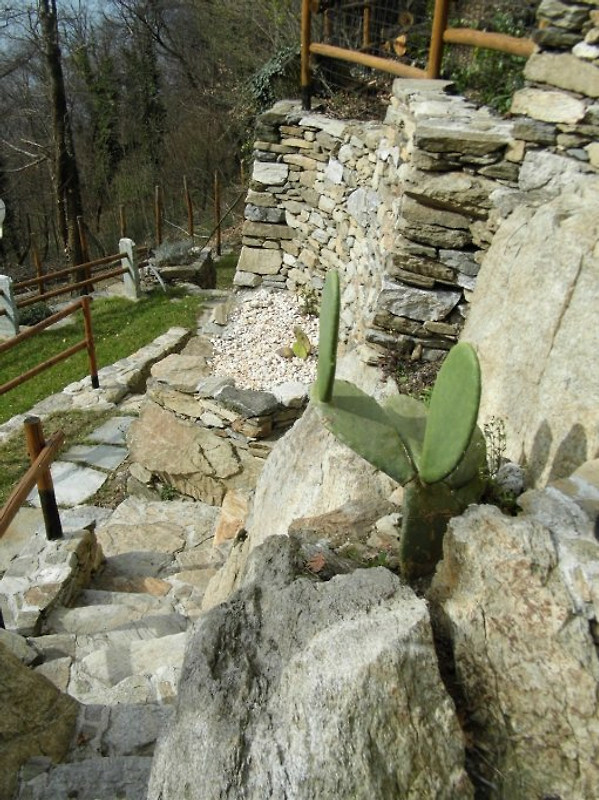 Although we are in the middle of a forest, Cascina Borchina is surrounded by ancient rocks and stone walls, which was used in the history for the cultivation of fruit plants and wine. Today we have lemon trees, herb cacti, wild cherry, oak and hazelnut, chestnut and whitethorn. Cascina Borchina is literally surrounded by nature and surrounded by forest paths, although we can be reached by car quickly. 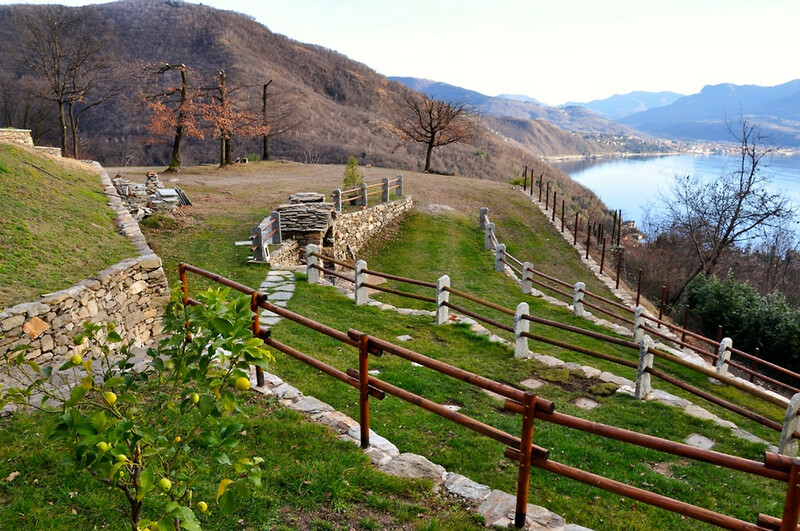 For those who want to spend a relaxing holiday, to rest around a close contact with the nature, Cascina Borchina is ideal. For this reason, we welcome sportsmen and yoga lovers, moutain bikers, hikers, couples seeking romance, but also families and friends who want to go on holiday together. Cascina Borchina, everyone is welcome, but not recommended for small children, as there are many walls and stairs in the garden. Remarkable is the fact that there are no other houses near Cascina Borchina, you can hear and see no cars just from the guests. An exclusive ambience, finca with a view of the countryside, country estate, peace and nature, although we can be reached by car quickly. Cascina Borchina can be reached by car in about 10 minutes from Maccagno and its beaches (about km from the hill). You have to get up on the hill about five minutes, in the direction of Campagnano. Before Campagnano turn into a dirt road. In the case of a low sports car, we recommend driving slowly. Maccagno is a famous holiday destination from spring to late autumn, due to its proximity to the border with Switzerland (about 6 km). Maccagno is a small town on Lake Maggiore, which offers a lot: Freeclimber in every season directly at the rocks of the Lago, hiking and cycling (road bike and mountain bike) and the famous market on Wednesday in Luino (about 5 km away) Visit the museum of contemporary art, take long walks along the lake, go swimming, boating, pedal boating, beach volleyball or tennis, (directly at the lake) or eat in good restaurants and pizzerias Km from the finca. 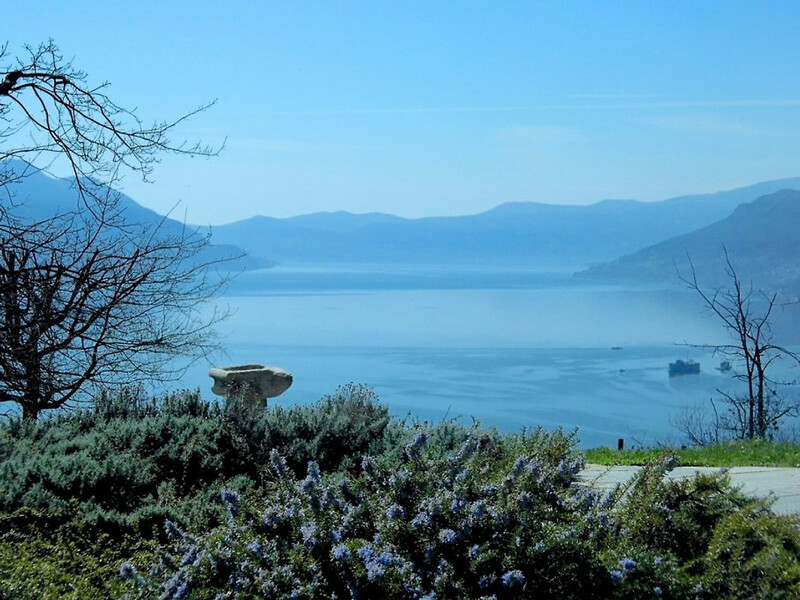 In spring, summer and autumn, Maccagno offers boat trips to Stresa, Cannobbio, Locarno and the Borromean Islands and many other beautiful places. During the autumn season, Cascina Borchina is ideal for long walks and for freeclimbers, but also in the cities shopping and sightseeing. By car: Lugano (Switzerland) is only 35 minutes, Locarno (Switzerland) 30 minutes, Milan in about 1:20 by car or train, Lake Como, about 1 hour and 15 minutes. Near Lugano, there is also an outlet with over 80 shops open all year round. 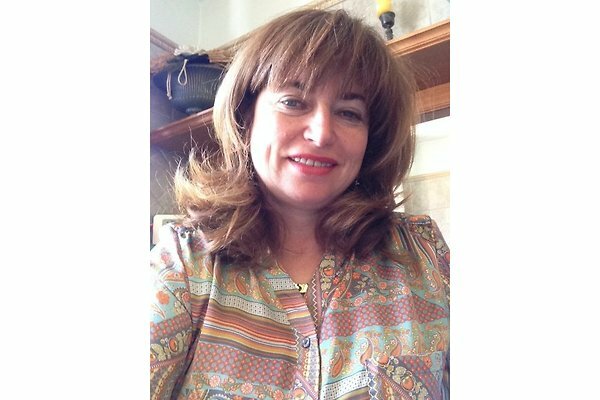 Maccagno has a post office, a pharmacy, a bank and a supermarket, a laundry and a car-sharing service, several well-developed climbing walls for freeclimbers. 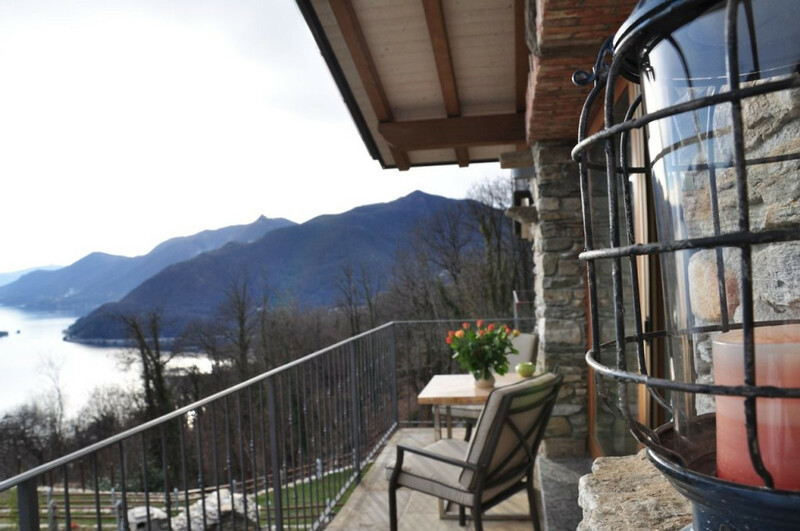 Ski: The small but very fine ski resort at Monte Ceneri above Lugano is only 35 minutes away from the finca. The high-alpine ski resorts in the Aosta Valley, such as the magnificent area around Monte Rosa, Cervinia at the foot of the Matterhorn or Courmayeur on the southern side of the Mont Blanc, can be easily reached via the motorway approximately 2 1/2 hours driving time. This is even worth a day trip! Golf: Our beautiful holiday paradise is also an ideal destination for passionate golfers. 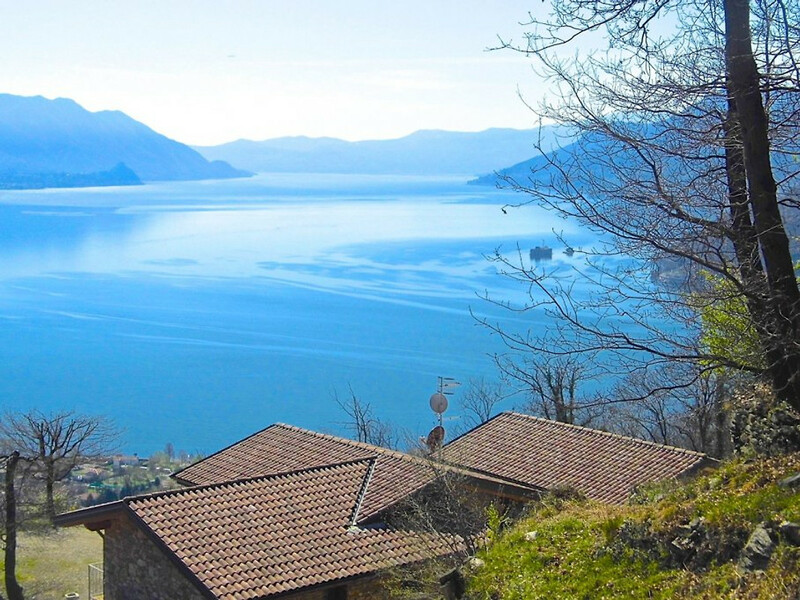 The old Lugano Golf Club is only 25 minutes away by car in the small town of Magliaso, directly on Lake Lugano. Also the golf club near the lake of Varese is well reached in about 45 minutes by car. The 'Le Robinie Golf Course' was designed by Jack Niklaus as a beautiful green garden. The 18-hole golf course is a masterpiece with amphitheater, bunker, terraces, ponds, valleys and hills. Everything is coordinated, the course is a challenge for every golfer and compels him so many skills and abilities. The course includes a driving range with 18 covered slopes, 2 putting greens, pitching green, clubhouse with changing rooms, well stocked Pro Shop; Hotel complex with indoor pool and fitness area, seminar rooms and large car park. The course is open all year round (except on 1 January and 15 August). A wonderful place for an exciting holiday. More than ten years ago, we looked at the lake and dreamed with open eyes and year by year, stone by stone, has become reality from Finca Cascina Borchina. Restored by us and rebuilt, according to old pre-existing farmhouses, it is now a small finca with our family business, opening in April 2017. 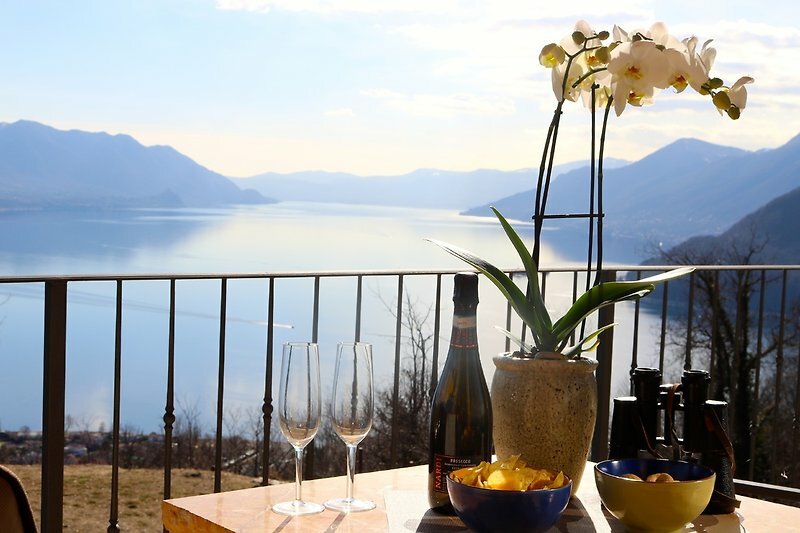 Wir haben eine traumhafte Woche in der wunderschönen Wohnung mit dem unbezahlbaren Blick auf den Lago Maggiore verbracht. Die Ausstattung ist perfekt und die beiden Gastgeber kümmern sich unaufdringlich um ihre Gäste. Von der abenteuerlichen Anreise über Stock und Stein darf man sich nicht zu sehr beeindrucken lassen. Danke Bettina und Andrea für die entspannte Zeit bei euch! Eine unglaublich schön gelegene Apartmentanlage mit einem einmaligen Blick über den halben See. Die Apartments sind superschön und individuell ausgestattet und die Vermieter einfach unglaublich nett und in jeder Situation hilfsbereit. Nur die Zufahrt zu der Anlage ist nichts für sportliche PKW; da sollte man schon besser mit einem SUV anreisen. Wir suchten für eine Woche Entspannung, Ruhe und Erholung. 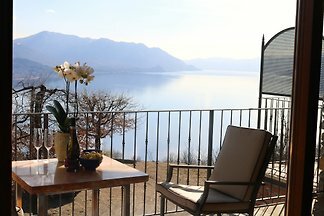 All dies fanden wir in der Finca Cascina Borchina, in wunderbarer Lage inmitten herrlicher Natur mit einem atemberaubenden Blick über den Lago Maggiore. Bei Ankunft wurden wir äußerst herzlich und liebevoll von Bettina und Andrea, unseren beiden Gastgebern empfangen, wobei sofort zu spüren war, den beiden liegt das Wohl ihrer Gäste am Herzen. Diese Hingabe war ebenfalls unschwer in der Gestaltung des gesamten Anwesens zu erkennen, welches mit gestalterischer Schönheit und mit Respekt gegenüber der Natur in Erscheinung tritt und trotzdem mit dem Charme von Luxus und Besonderheit besticht. Wir konnten auf dem Balkon mit herrlichem Seeblick chillen, herrlich frühstücken und abends bei Kerzenlicht ein Glas Wein genießen. Schönes Haus in toller Aussichtslage; Zufahrt kurvenreich und teilweise eng . Wer Ruhe, Natur und Einsamkeit sucht, ist hier richtig. Gute Betreuung durch Hausherrin Bettina. Wir haben uns sehr wohl gefühlt. Dank an Bettina und Ehemann Andrea. Wir haben diese Wohnung Falco anhand der Fotos und den sehr guten Bewertungen gebucht. Was soll ich sagen das Landgut und die Aussicht sind eine Wucht, wirklich einmalig. Die Lage absolut ruhig und von überall hat man einen grandiose Sicht auf den See. Wir hatten einen “Abstellplatz“ direkt an der Wohnung zum aus-und einladen, das war wichtig für uns, da wir Räder und viel Gepäck mit dabei hatten. Etwas weiter ist dann der "richtige" Parkplatz . Die Ausstattung und die liebevolle Gestaltung des Hauses waren nicht zu toppen. Man merkt, dass das Haus den Eigentümern am Herzen liegt und sie hier auch selbst wohnen. 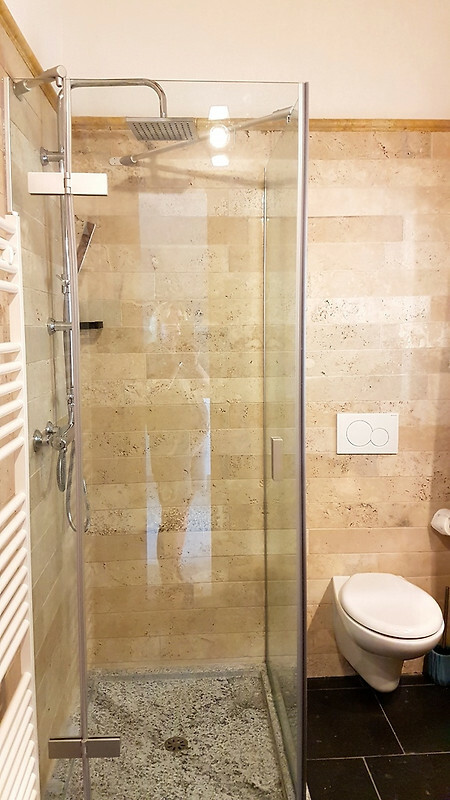 Die Wohnung ist super gepflegt mit massiven Möbeln, Marmorboden und eine tolle Steindusche, schöne Küche mit Dekoration, und sehr bequemen Betten. Man hat vom Essplatz und vom Bett eine tolle Sicht auf den See und den Bergen. Das Landgut hatte für uns eine optimale Lage für Ausflüge mit dem Rad oder zu Fuß. Mit seiner Ausstattung und Lage ist es eine Perle, jeder der hier seinen Urlaub verbringen kann, ist ein Glückspilz. Wir haben wieder für den Herbst gebucht. Oder einfach: alles super genial. Angefangen von der herzlichen Begrüßung durch Bettina, ( deutsch sprechend ) ,die tolle Betreuung vor Ort, die stilvolle und gemütliche Einrichtung, die super Ausstattung der Wohnung bis über die traumhafte Aussicht auf den Lago Maggiore, kamen wir aus dem Staunen nicht mehr raus. Wir haben unseren Aufenthalt sehr genossen und uns richtig wohl gefühlt. 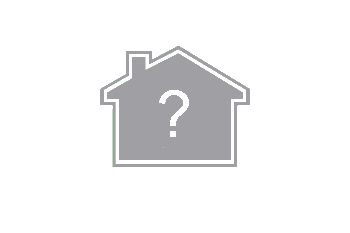 Jederzeit würden wir diese Wohnung wieder buchen. Wir freuen uns sehr, dass Sie Ihr Urlaub bei uns genossen haben und würden uns freuen, euch wieder begrüßen zu dürfen! Vielen Dank für Eure positive Bewertung! Eine unglaublich schön gelegene Apartmentanlage mit einem einmaligen Blick über den halben See. Die Apartments sind superschön und individuell ausgestattet und die Vermieter einfach unglaublich nett und in jeder Situation hilfsbereit. Nur die Zufahrt zu der Anlage ist nichts für sportliche PKW; da sollte man schon besser mit einem SUV anreisen. Wir suchten für eine Woche Entspannung, Ruhe und Erholung. 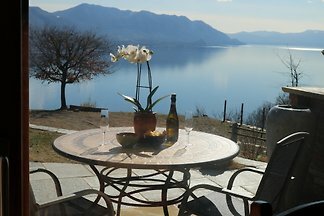 All dies fanden wir in der Finca Cascina Borchina, in wunderbarer Lage inmitten herrlicher Natur mit einem atemberaubenden Blick über den Lago Maggiore. Bei Ankunft wurden wir äußerst herzlich und liebevoll von Bettina und Andrea, unseren beiden Gastgebern empfangen, wobei sofort zu spüren war, den beiden liegt das Wohl ihrer Gäste am Herzen. Diese Hingabe war ebenfalls unschwer in der Gestaltung des gesamten Anwesens zu erkennen, welches mit gestalterischer Schönheit und mit Respekt gegenüber der Natur in Erscheinung tritt und trotzdem mit dem Charme von Luxus und Besonderheit besticht. Wir konnten auf dem Balkon mit herrlichem Seeblick chillen, herrlich frühstücken und abends bei Kerzenlicht ein Glas Wein genießen. Wir kommen ganz bestimmt wieder. Schönes Haus in toller Aussichtslage; Zufahrt kurvenreich und teilweise eng . Wer Ruhe, Natur und Einsamkeit sucht, ist hier richtig. Gute Betreuung durch Hausherrin Bettina. Wir haben uns sehr wohl gefühlt. Dank an Bettina und Ehemann Andrea. Wir haben diese Wohnung Falco anhand der Fotos und den sehr guten Bewertungen gebucht. Was soll ich sagen das Landgut und die Aussicht sind eine Wucht, wirklich einmalig. Die Lage absolut ruhig und von überall hat man einen grandiose Sicht auf den See. Wir hatten einen “Abstellplatz“ direkt an der Wohnung zum aus-und einladen, das war wichtig für uns, da wir Räder und viel Gepäck mit dabei hatten. Etwas weiter ist dann der "richtige" Parkplatz . Die Ausstattung und die liebevolle Gestaltung des Hauses waren nicht zu toppen. Man merkt, dass das Haus den Eigentümern am Herzen liegt und sie hier auch selbst wohnen. 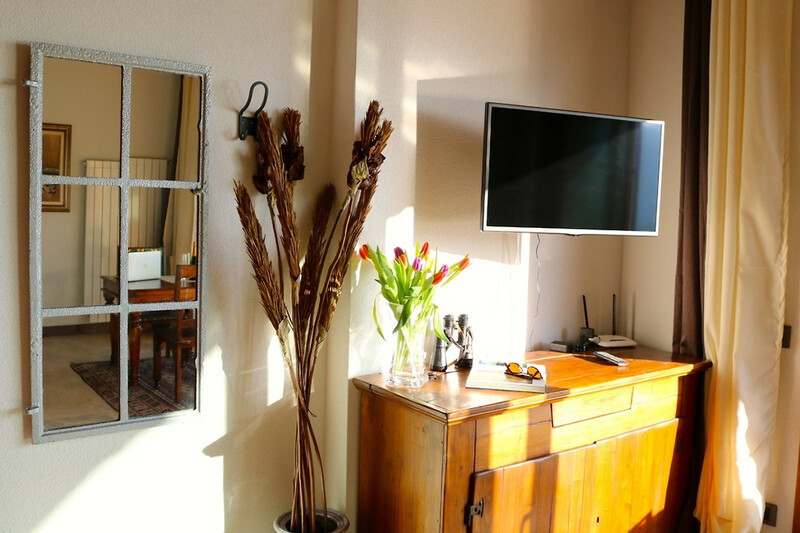 Die Wohnung ist super gepflegt mit massiven Möbeln, Marmorboden und eine tolle Steindusche, schöne Küche mit Dekoration, und sehr bequemen Betten. Man hat vom Essplatz und vom Bett eine tolle Sicht auf den See und den Bergen. Internetzugang ist einwandfrei. Das Landgut hatte für uns eine optimale Lage für Ausflüge mit dem Rad oder zu Fuß. Mit seiner Ausstattung und Lage ist es eine Perle, jeder der hier seinen Urlaub verbringen kann, ist ein Glückspilz. Wir haben wieder für den Herbst gebucht.